There is no end to cruel and bloodletting sports continuing to take place in Pakistan. One such sport is pig and dog fight. The sport has a history and tradition in Punjab and Sindh, and special dogs are trained for the activity. Some dogs used for hunting pigs are brought up with utmost care. Many hunters buy dogs from Sindh and their prices can range from Rs 40,000 to Rs100,000. In Chakwal there is a team of pig-hunters in every village. Till recent years, hunters would hunt for pigs in jungles located in the vicinity but due to deforestation, they now have to go to Taxila. Recently a team of hunters from Dhakku and Lakhwal villages went to jungles of Taxila and caught a pig and brought it back, to showcase it in a gladiatorial-like setting, where everyone came just to see the ‘blood flow’. One Saturday morning, people from the villages of Dhakku, Odherwal, Chakora and Lakhwal all conglomerated on a ground 8km away from Chakwal city. In a short time the ground was packed with people of all ages. Soon all eyes were set on the road where a pickup van made a foreboding appearance. As the van got closer, the crowd got excited and started shouting. The van was carrying a wild boar which was caught by the hounds owned by local hunters. When the boar was offloaded, one noticed that the animal was injured and tied with a rope. “Only one dog would be set loose on the pig,” shouted the leader of the hunting crew. Thus the painful event began. Dogs attacked the pig one after the other — it was like a blood fest. When the hunters noticed that the pig had fallen to the ground, they threw water over it, in order to revive it for another fight but it was too late, the animal was already dead. On the question of curbing such activities, District Wildlife Officer Khalid Sahi said that wild boars are not under the protection of wildlife department that is why the department cannot take any action against hunters. “There was a time when the government used to encourage the killing of wild boars as they destroyed crops”, he elaborated. On April 7, 2014, as many as 14 people were arrested within the limits of the industrial area police station for hunting wild boars. 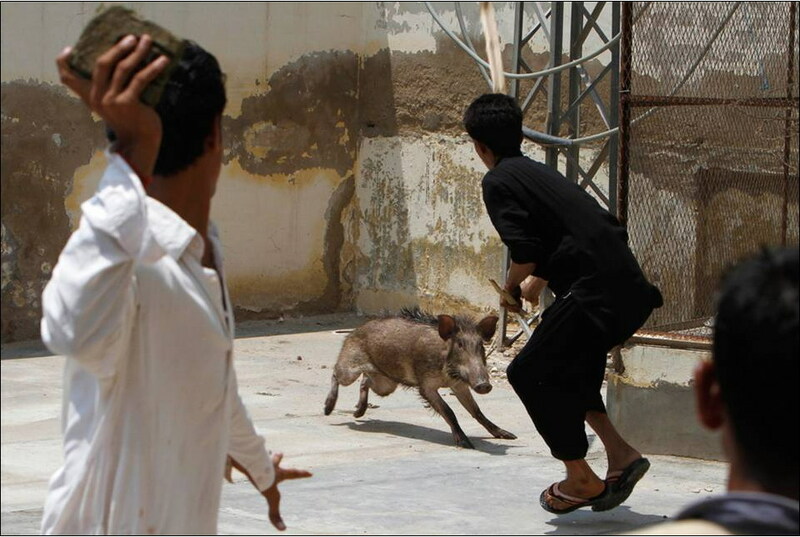 Two wild boars were also recovered from the culprits, who were caught red-handed. The hunters, who belonged to Chakwal, were freed after they paid a fine of Rs 54,050. It is pertinent to mention that, although there is a ban on hunting wild boars within the limits of Islamabad, various groups are involved in capturing these boars with the help of dogs, and then use them for gambling in rural areas. A CDA official was tipped about a group of hunters who were catching boars in Sector H-8. A team of the wildlife department (WLD) of CDA reached the area and saw a pick-up truck parked in the green belt. “We saw that a wild boar was in the truck and, soon, the hunters brought another wild boar, which was tied to a bamboo,” he said. When contacted, the range officer of WLD, Mehmood Alam Choudhry, confirmed that the operation took place. He also mentioned that the industrial area police were called for assistance with the arrests. “Initially, it was decided to send the hunters to jail, but there is an option of imposing a fine, so they were released after they were fined, which was deposited in the exchequer,” he said. The boars, however, were returned to the hunters, because one of the boars had already died and the other was critically injured, which could be dangerous for the local residents. There is a ban on the hunting of boars without a licence; however, from time to time, licences were issued for hunting. As per the rules, a permit is issued to the hunters, but they have to get a character certificate and a weapons’ permit, which is issued by the deputy commissioner. There is no fee for the licenses. There are a number of people who have been involved in the hunting of the wild boars. They shift the boars to the rural areas, and then tie them with a rope. Then dogs are let loose on the boars, and people gamble on them. It is the duty of WLD to curb illegal hunting, but the department is highly understaffed and ill-equipped. Mehmood Alam Choudhry said that the police was requested for assistance with the arrests, due to the lack of officials in WLD. “Luckily, the police reached on time; otherwise it would have been impossible to arrest 14 hunters. I also informed the director wild life, Syed Sajjad Hussain Shah, about the incident,” he said. 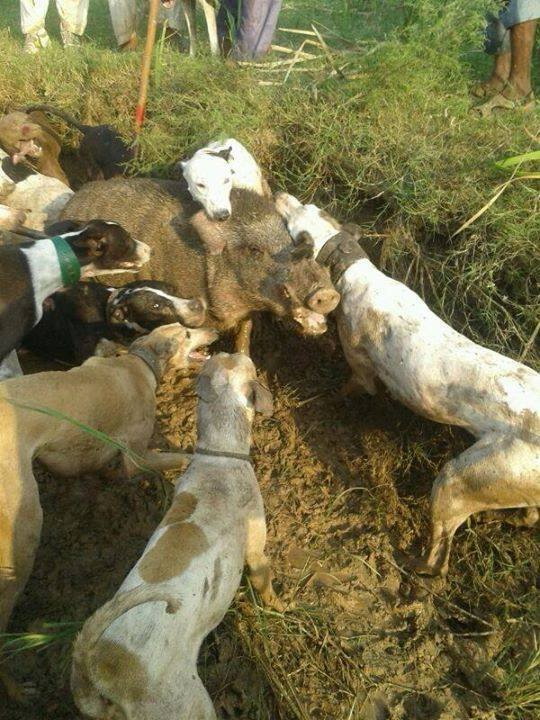 While catching the boars, the dogs are also badly injured, so, it is a cruel game of hunting, and it should be stopped. What a bunch of disgusting backward ignorant cruel waste of oxygen!! Even in modern times these people are unable to improve and behave with a sense of dignity or simple intelligence! The evil in their lives have consume them to such levels it has removed every shred of intelligence! 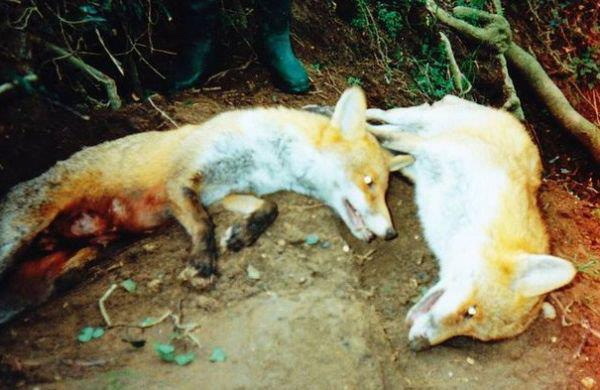 All people involved in anything like this cruelty should be shot, nothing less. Pakistan is over crowded as it is, kill them all.